Space is one of the most important design considerations when it comes to your home. It’s almost universally accepted that the more spacious your rooms are, the more appealing they feel, and your furniture will play a big part in this. Clearly, you can make some space by having fewer items, and generally less clutter, but your choice of furniture will play a part. Here are some ideas for furniture that will maximise your space. Nests of tables look great, and just like Russian dolls, they stack neatly away when you’re not using them. This means that you’ve got the option of several tables when you’ve got guests, or just a single one for the rest of the time. Space and practicality combined. 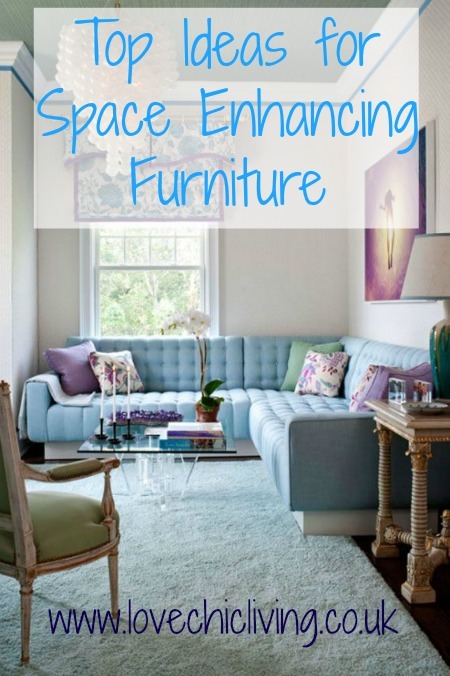 Space can often be lost in the corner of a room, but with a sofa that fits nicely into it, you can take advantage. Corner sofas also look great from a design perspective, and can usually accommodate several people. You can buy fabric sofas UK at Sitting and Sleeping, who also make bespoke sofas if you’re really into maximising your space. If space really is at a premium, forget table or floor lamps, and keep all of your lights on the ceiling. Whether this means LED spotlights, or a chic chandelier, you’ll be keeping space free, and decorating the large white space above you. If you want even more light, then you can consider a floor lamp with a small base that you can place round the back of the sofa – great for reading with. Ottoman style beds, or ones with built-in drawers are ideal for saving space. You might be surprised by the amount of clothes that you can fit in one of these types of bed. The lift-up ottoman is best if you’ve got things to store that you don’t use on a daily basis, where draws are better for general clothing. Combine two items of furniture into one. Everyone likes a good comfy footrest, but they can take up quite a lot of space in your living room. Fortunately, you can get ones that lift open, revealing a great place to store clutter such as magazines and books. Give a little thought to your furniture, and you can enhance the space you’ve got to work with. It’s all about making the most of every corner of the room. Great post. In the UK we have some of the smallest homes in Europe. I think we are listed as second. Quite a surprising fact so anything that can be done to save space whilst ensuring people have the same level of living standards is very important. Very useful. I have the smallest apartment in the whole world I guess. I will use some of your space saving ideas. Thanks so much.